I can't say enough how wonderful our tour guide Hide was. He really took great care of my family. Above and beyond service on our Japan tour. I will miss him! 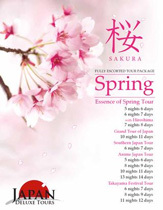 Japan Deluxe Tours provided incredible service. Very nice hotels!! Love the free WiFi, love pajamas, hair dryer and tooth brush included with every new hotel. Excellent food!!! Loved the breakfast buffet!! All meals were great, my least favorite is the Japanese pancake but I loved the udon, dry gyoza, rice meals, JFC: Japanese Fried chicken. Hide was awesome!!! Very attentive to everyone's needs and very helpful and caring person. He does a lot of work being charge of so many people. My favorite was Hiroshima A bomb dome and least favorite was Glover Garden. That was a boring place.